The EM2010 is a Type 1 environmental noise monitor for the medium and long term monitoring of sound levels. It is quick and easy to install, just needing power and a connection to the cell network. The EM2010 Environmental Noise Monitor consists of an Outdoor Microphone, an acoustic processing unit, and a power supply. It can be connected up in minutes - just connect the microphone and power supply to the processor and away it goes. The unit will automatically measure the periodic Leq and L90 along with many other parameters, storing the results internally and uploading them to the web server every five minutes. The EM2010 can be set to record the audio when preset conditions are met. Listening to the audio is the best way to identify the source of high noise levels. The EM2010 is for monitoring environmental noise, generally around industrial areas and in communities. It is ideal for any noise monitoring applications that demand a unit that meets IEC 61672 Class 1 or ANSI S1.4 Type 1 and requires access to the noise measurements through a standard web browser. The EM2010 Noise Monitor comes with the GSM link (connection to cell network) already operating. All you need to do is position the monitor and apply power. 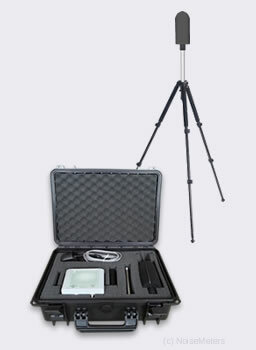 The whole kit, including the microphone, is protected against poor weather conditions and rain. 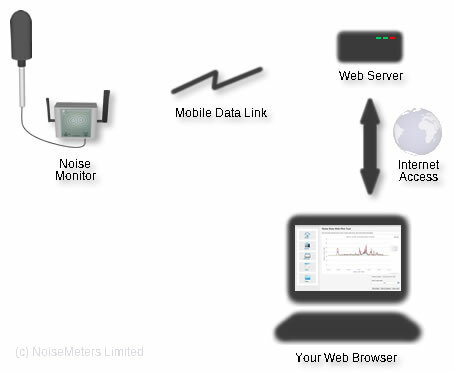 As the noise monitor uploads all its measurements to a web server, you just need a standard web browser and access to the Internet to view the reports.